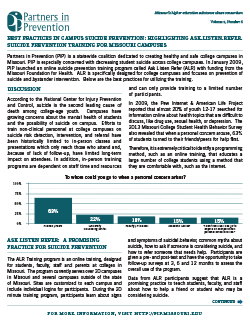 Beginning in Fall 2012, Partners in Prevention began publishing monthly research briefs. 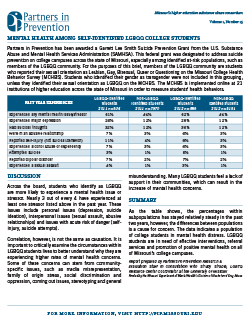 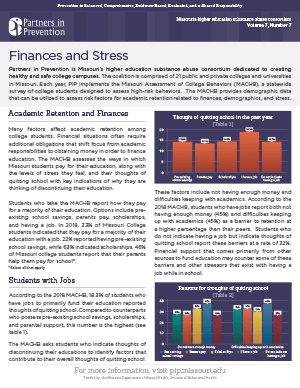 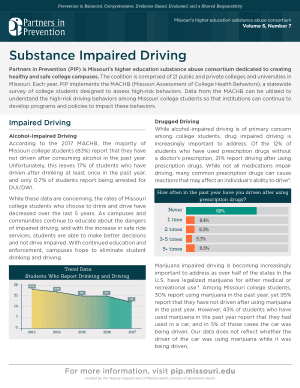 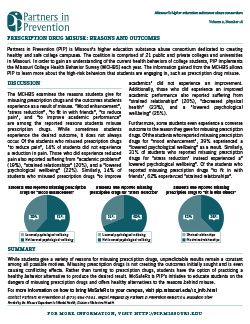 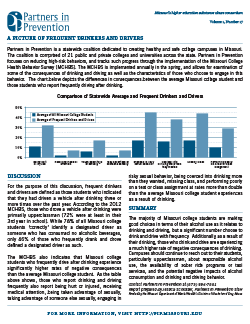 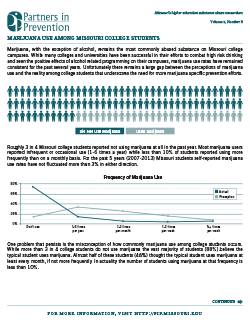 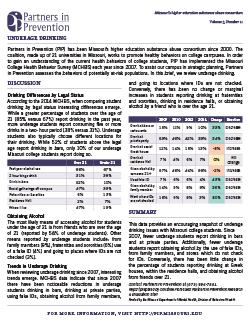 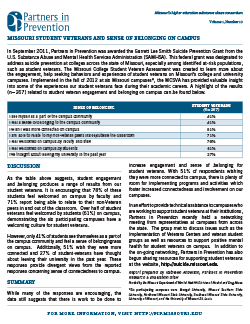 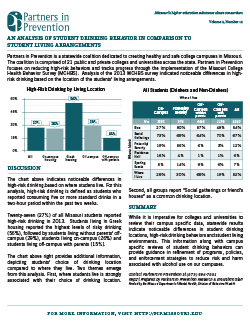 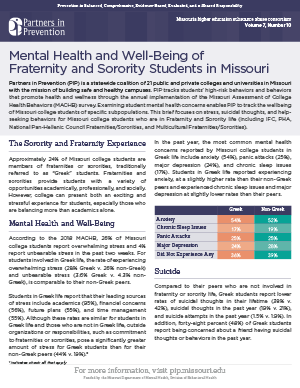 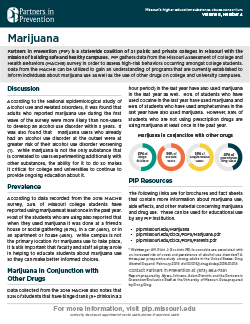 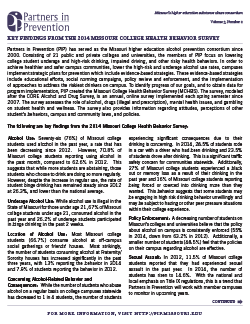 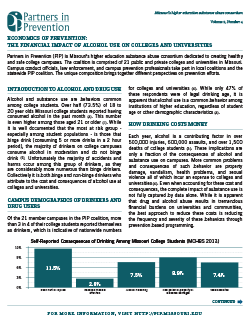 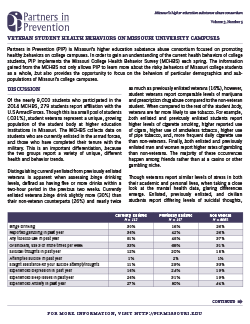 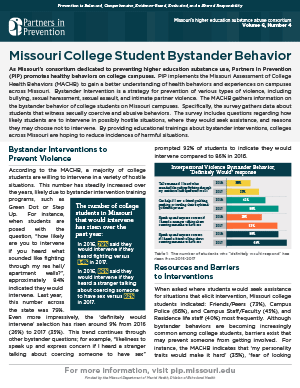 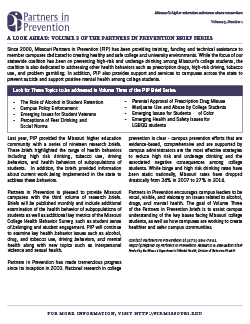 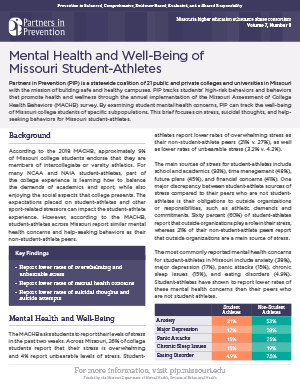 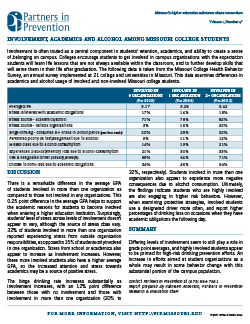 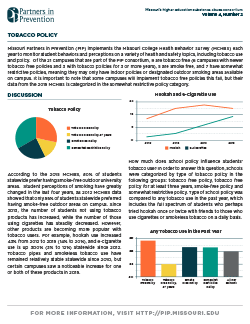 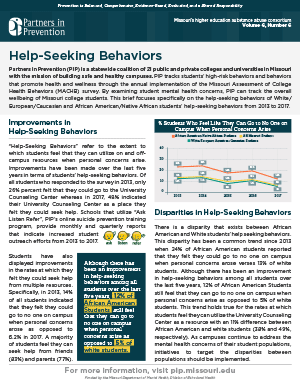 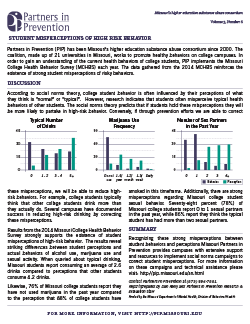 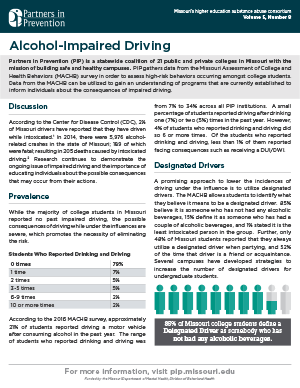 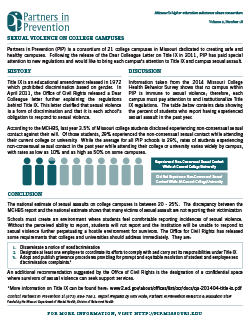 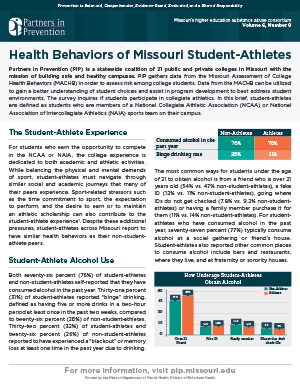 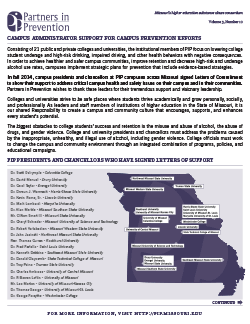 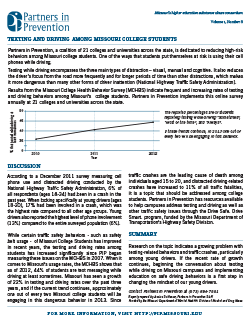 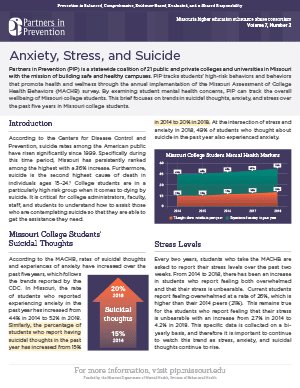 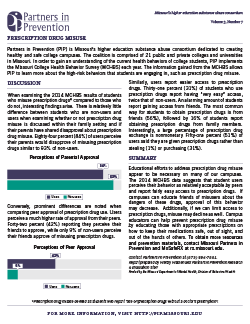 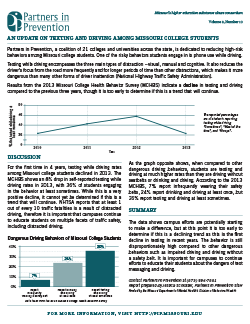 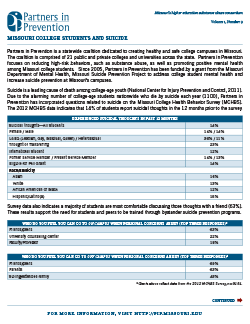 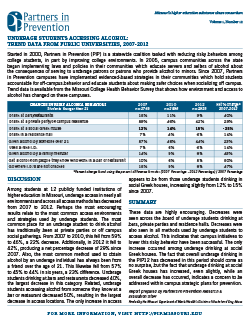 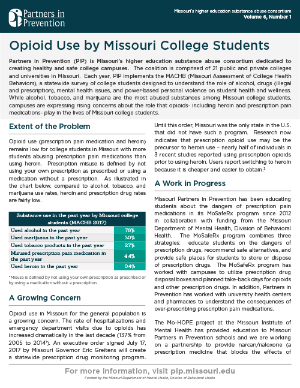 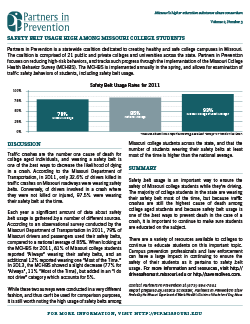 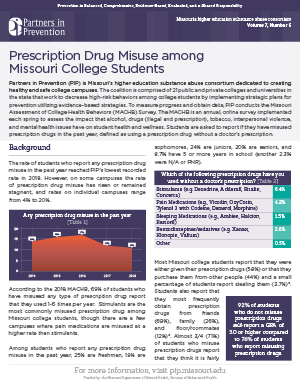 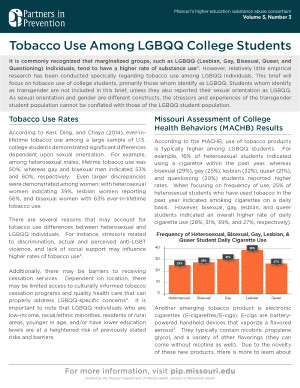 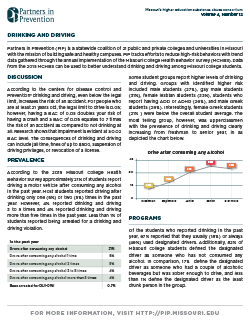 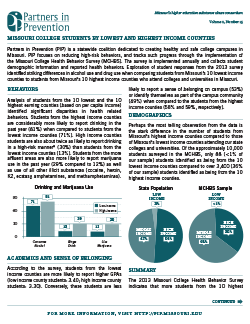 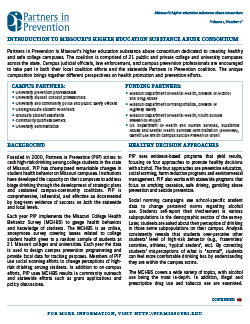 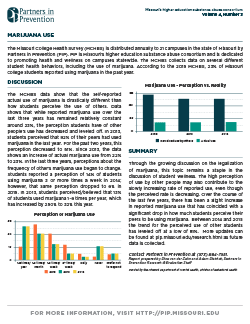 Each month, PIP members and campus administrators will receive a one-page research brief to keep key players updated on the most recent trends in the health and safety behaviors of Missouri college students. 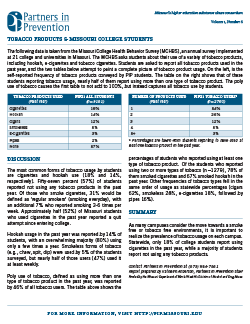 Click here to download the Volume 1 Anthology. 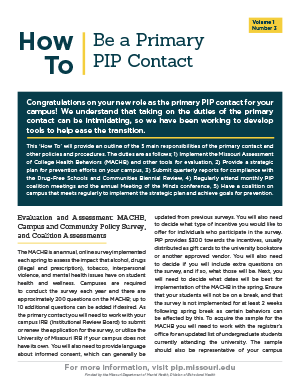 Click here to download the Volume 2 Anthology. 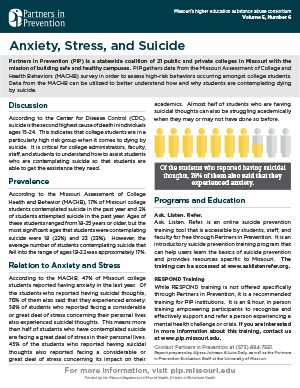 Click here to download the Volume 3 Anthology. 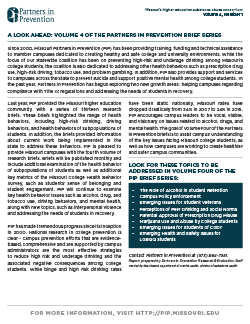 Click here to download the Volume 4 Anthology. 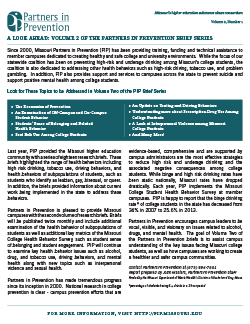 Click here to download the Volume 5 Anthology. 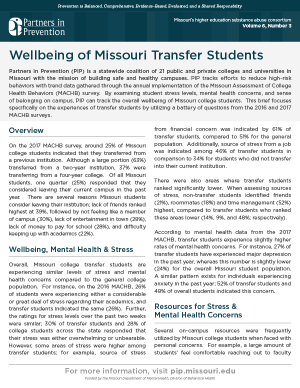 Click here to download the Volume 6 Anthology. 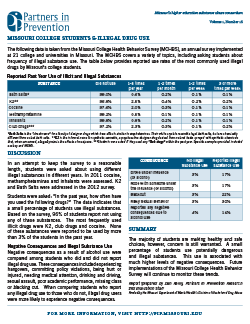 Illegal Drugs + click here to learn more! 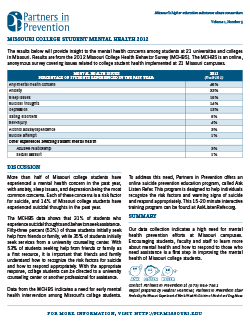 Mental Health + click here to learn more! 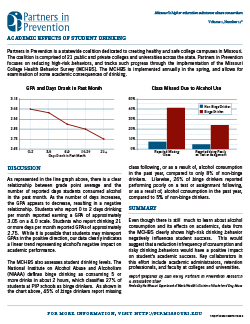 Alcohol + click here to learn more! 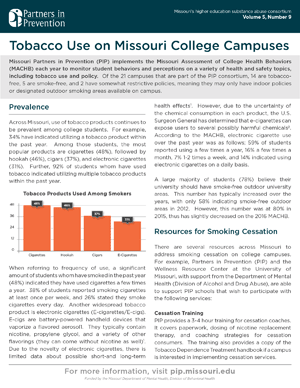 Tobacco Use + click here to learn more! 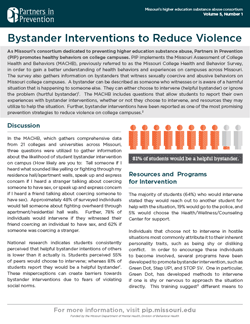 Power-based Personal Violence + click here to learn more! 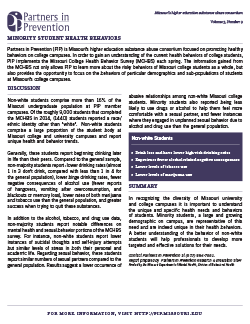 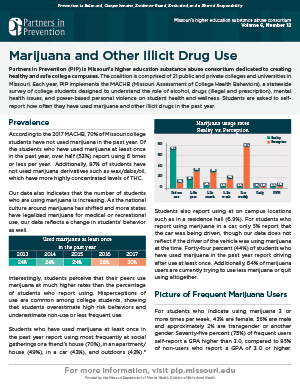 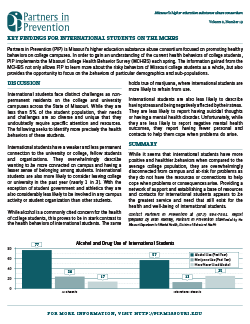 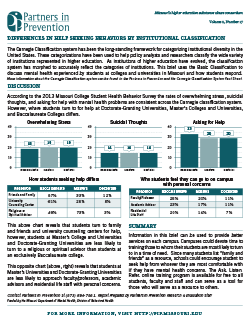 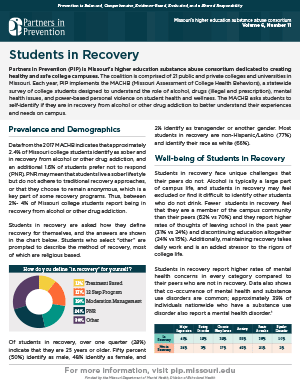 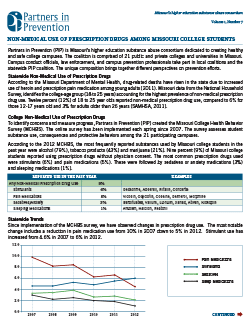 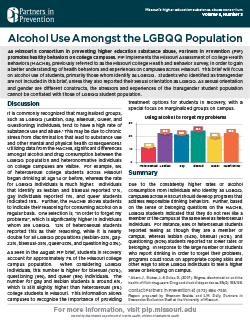 First implemented in 2007, the Missouri Assessment of College Health Behaviors (formerly referred to as the Missouri College Health Behavior Survey or MCHBS) is designed to understand the role of alcohol, drugs (illegal and prescription), mental health issues, and power-based personal violence on student health and wellness. 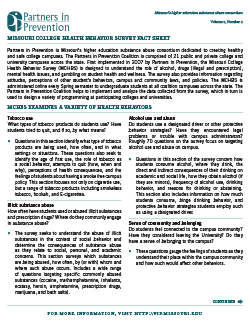 The survey also assesses individual’s attitudes towards campus and community policies, other student’s behavior, and bystander interventions. 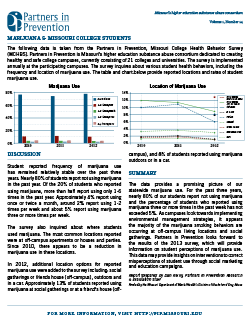 The MACHB is administered online every spring to undergraduate students at Coalition campuses across the state. 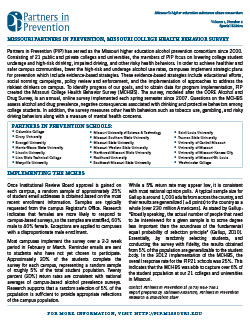 Partners in Prevention (PIP) is Missouri’s higher education substance abuse consortium dedicated to creating healthy and safe college campuses. 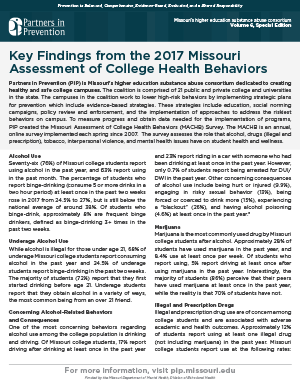 The coalition is comprised of 21 public and private colleges and universities across the state that work to lower high-risk behaviors among college students by implementing strategic plans for prevention using evidence-based strategies. 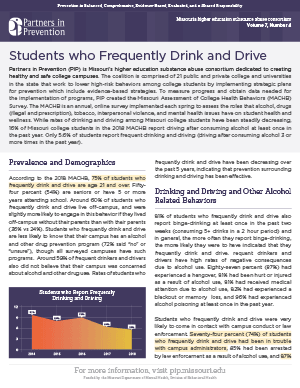 Alcohol and other drug prevention works to change the underlying conditions that lead to a problem. 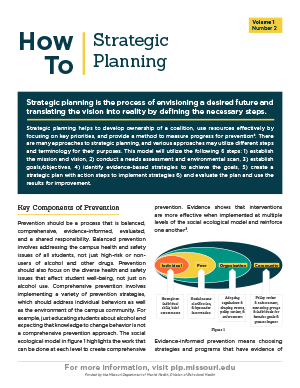 There are 3 types of prevention; primary, secondary, and tertiary. 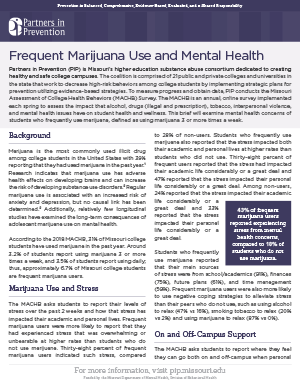 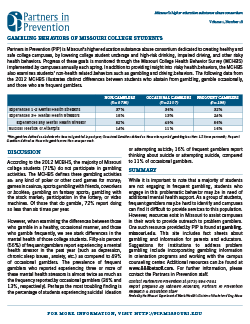 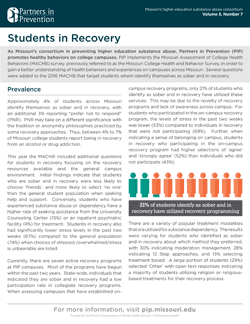 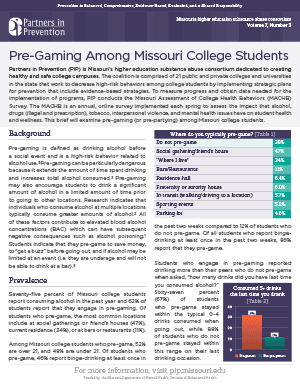 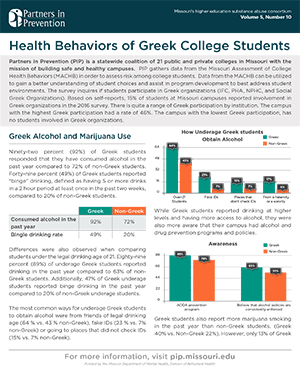 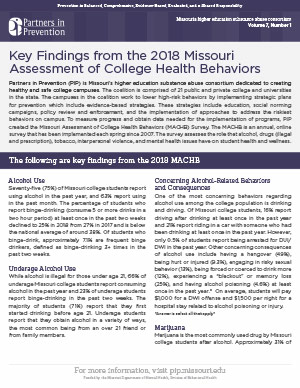 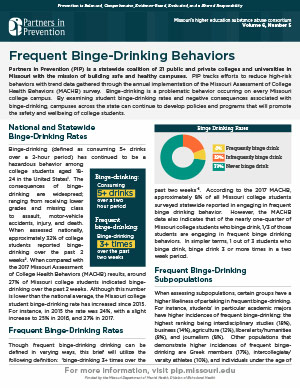 First implemented in 2007 by Partners in Prevention, the Missouri College Health Behavior Survey (MCHBS) is designed to understand the role of alcohol, drugs (illegal and prescription), mental health issues, and gambling on student health and wellness. 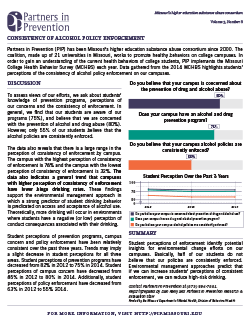 The survey also provides information regarding attitudes, perceptions of other student’s behaviors, campus and community laws, and policies. 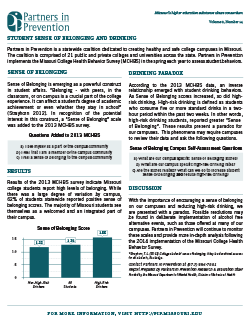 The MCHBS is administered online every Spring semester to undergraduate students at all coalition campuses across the state. 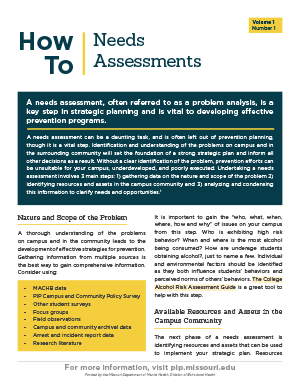 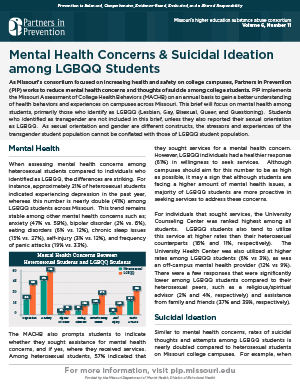 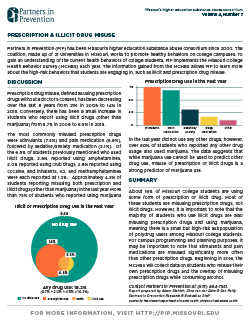 The Partners in Prevention Coalition helps to implement and analyze the data collected from the survey, which in turn is used to design a variety of programming at participating colleges and universities. 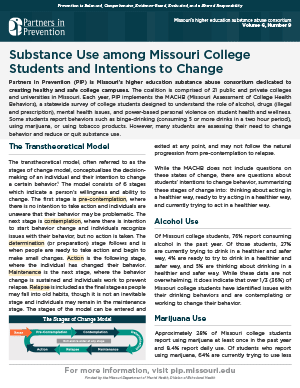 SAMHSA’s Center for the Application of Prevention Technologies (CAPT) has recently released a new resources on drinking and substance abuse: Youth Marijuana Use: Consumption, Consequence, and Risk and Protective Factor Data Resources, which offers prevention practitioners a comprehensive listing of available data resources and surveys developed by and for a range of federal agencies. 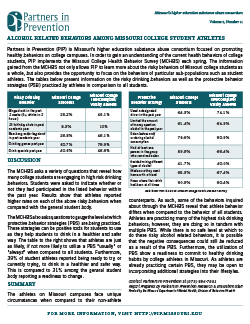 Risk and Protective Factors Associated with Binge or Episodic Drinking Among Adolescents and Young Adults: Using Prevention Research to Guide Prevention Practice: provides an overview of risk and protective factors associated with binge drinking, detailed summaries of individual research studies and their findings, and a separate section that highlights factors relevant to college populations and campuses. 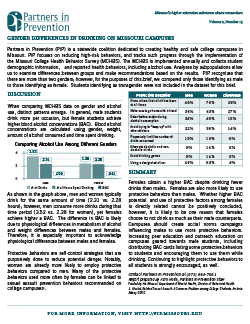 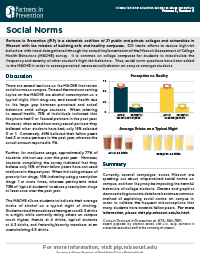 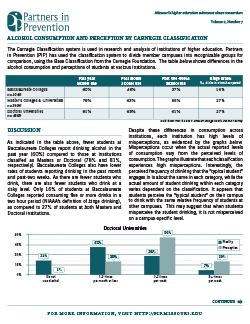 Strategies to Prevent Binge or Heavy Episodic Drinking Among Adolescents and Young Adults: Using Prevention Research to Guide Prevention Practice: Provides an overview of the relevant literature, including a separate section on strategies shown to be effective with college populations, descriptions of individual studies, and tips for using the document to inform prevention planning. 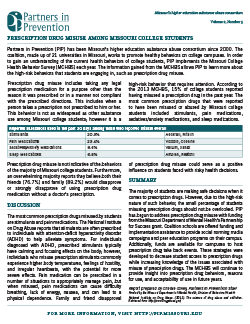 Risk and Protective Factors Associated with the Non-Medical Use of Prescription Drugs: Using Prevention Research to Guide Prevention Practice: Provides an overview of risk and protective factors associated with prescription drug misuse, detailed summaries of individual research studies and their findings, and a separate section that highlights factors relevant to college populations and campuses. 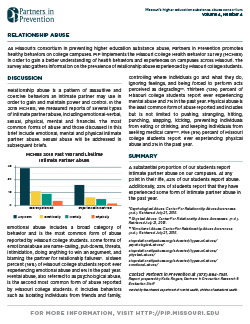 College Student Perceptions of Victim Action: Will Targets of Stalking Report to Police? 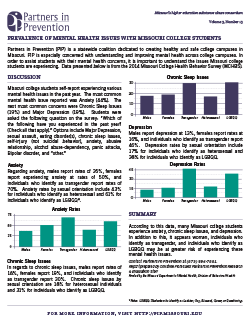 Are Female College Students Who are Diagnosed with Depression at Greater Risk of Experiencing Sexual Violence on College Campus?